The research, published Friday, Nov. 24 in the journal Nature Communications and led by Stanford's Scott Fendorf and former postdoc Marco Keiluweit, finds that these oxygen-free pockets of soil are vulnerable to disruption from climate change and some farming practices. 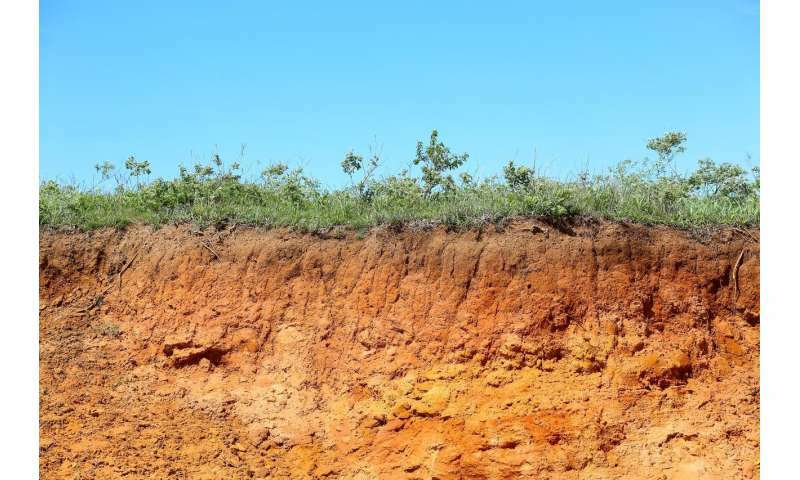 The scientists said this work could help in modeling future carbon emissions by giving better predictions of how much CO2 might be released from the soil. "Fortunately, the climate modelers are paralleling us," said Fendorf, who is the Huffington Family Professor in Earth Sciences at Stanford's School of Earth, Energy & Environmental Sciences. "They need to appreciate this and they are." Soil contains three times more carbon than the atmosphere. Some of that carbon remains trapped underground through chemical reactions with minerals. However, most is in the form of decomposing plant and animal matter, which microorganisms break down to create energy and CO2 – the equivalent of our eating and breathing. This breakdown process normally requires oxygen, but in the small pockets of soil that lack oxygen, called anaerobic microsites, bacteria have evolved to extract energy from organic matter without oxygen, albeit less efficiently. These oxygen-starved microbes produce significantly less CO2 and are also unable to break down certain carbon-rich biomolecules such as waxes and lipids. "Anaerobic microsites play a protective role in that they preserve certain organic compounds that are abundant in soils worldwide, increasing carbon storage and decreasing CO2 emissions from soils," said Keiluweit, who is now an assistant professor at the University of Massachusetts at Amherst. But even though scientists have long known about the existence of anaerobic microsites, their prevalence and their overall contribution to the global carbon cycle – the exchanges of carbon between Earth's atmosphere, oceans and land systems – was not well understood and was not accounted for in ecosystem models that feed into future climate projections. "The general perception has been that habitats that are completely underwater such as wetlands and swamps are anaerobic, and that unflooded, or upland, soils are mostly aerobic," Fendorf said. "What we show in this study is that there's actually a very significant volume of upland soil that is sitting in anaerobic environments." In the new study, Keiluweit and his colleagues created anaerobic microsites in the lab by painstakingly manipulating the flow of oxygen to soil samples and then measured their CO2 output as well as their lipid and wax concentrations. What they found was that as oxygen became scarce, the soil microbes shifted from aerobic to increasingly less efficient anaerobic respiration. As a result, fewer carbon-rich lipid and wax molecules were decomposed and CO2 production dropped by a factor of 10. As a real-world check on their results, the researchers also examined soil from agricultural field sites in Oregon. Both the lab and field results showed remarkably consistent trends, indicating that, contrary to conventional wisdom, upland soils do in fact contain high volumes of anaerobic microsites that protect specific types of carbon molecules. "Based on our lab results, we would expect that soils rich in anaerobic microsites would have lots of lipids and waxes left over, and that's what we found in the fields," Keiluweit said. The new findings highlight the many ways that climate change and certain farming practices could alter these microsites and shift the amount of CO2 that is released from the soil. Warming soil, for example, is likely to increase the amount of CO2 released into the atmosphere. "Just like with us, when you warm microbes, you increase their metabolic activity," Fendorf said. In soil regions with oxygen, the resident bacteria will consume more of that plentiful oxygen and produce CO2 faster and more efficiently. Climate change is expected to make some regions wetter and others drier as weather patterns change. Those two trends have different impacts on soil microbes. Areas that receive more rain – or more irrigation through farming – will contain less oxygen and therefore likely produce less CO2. Drier soil generally has more oxygen and the microbes it contains will produce more CO2. However, under very dry conditions productivity drops for both aerobic and anaerobic microbes because water is essential for life. "Changes in soil moisture arising from irrigation or from climatic patterns will therefore alter the distribution of microbial metabolisms and the rate of CO2 production," Fendorf said. In addition, frequent loosening, or tilling, of soils aerates the soil, turning anaerobic microsites aerobic and increasing release of CO2. "Our findings highlight a benefit of low till practices and other land use practices that limit increased soil aeration," Fendorf said. More CO2 in desert like places has increased plant growth. Use CO2 to Increase Cannabis Yields!